Jumpshot recently compared U.S. click-through rates on Google search results for 2016 and 2018. The analysis grouped searchers’ activity into three categories: (i) no clicks on any search results, (ii) clicks on ads, and (iii) clicks on organic listings. For desktop users, the change from 2016 to 2018 was minimal. The three percentages — no clicks, ad clicks, organic clicks — were roughly the same in 2016 and 2018: 32.7 to 33.6 percent (no clicks); 4.6 to 6.0 percent (ad clicks); and 62.7 to 60.4 percent (organic clicks). But mobile searches showed a bigger change from 2016 to 2018, according to Jumpshot, with an increase in no clicks (56.1 to 61.4 percent) and ad clicks (3.9 to 8.9 percent) while organic clicks showed a marked decrease (40.1 to 29.7 percent). For desktop users, the change from 2016 to 2018 was minimal. 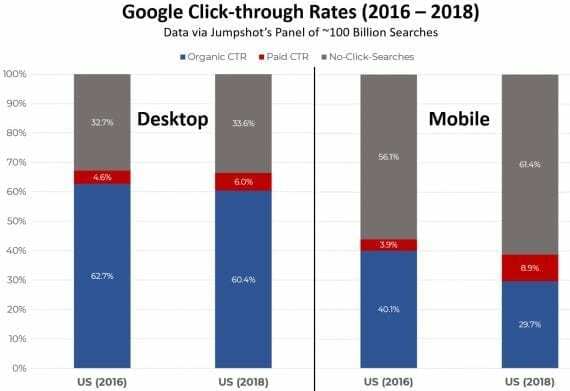 Mobile searches showed a bigger change, with an increase in no clicks (56.1 to 61.4 percent) and ad clicks (3.9 to 8.9 percent) while organic clicks showed a marked decrease (40.1 to 29.7 percent). Source: Jumpshot. Google’s Answer Boxes address searchers needs, resulting in fewer clicks on ads or organic listings. An example query is “how to clean leather,” shown above. 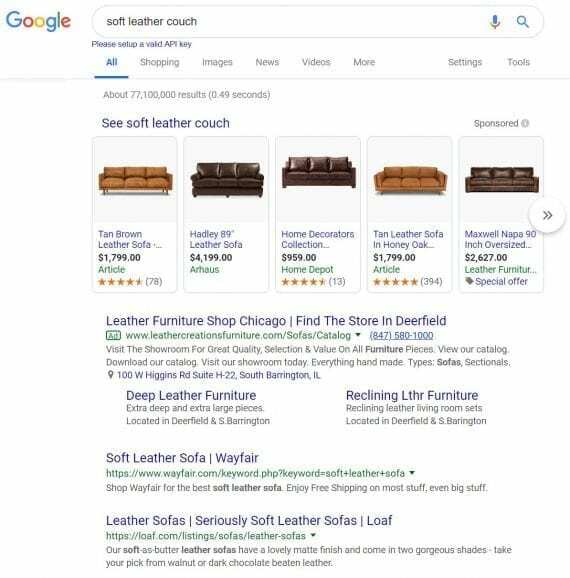 Few purchase-intent queries‚ such as “soft leather couch,” result in Answer Boxes in Google search. Purchase-intent keywords do not produce a sole correct answer in search results. It would be interesting to see the results of the Jumpshot’s analysis broken out by informational, transactional, and navigational searches. Transactional searches (such as ecommerce searches with purchase intent) and navigational searches (searches for a specific brand’s site) would be much more likely to result in a click on an organic listing. The difference is much more noticeable on smartphones, where the first screen of most search results is consumed by ads, Answer Boxes, pop-out videos, and listing types other than natural search. 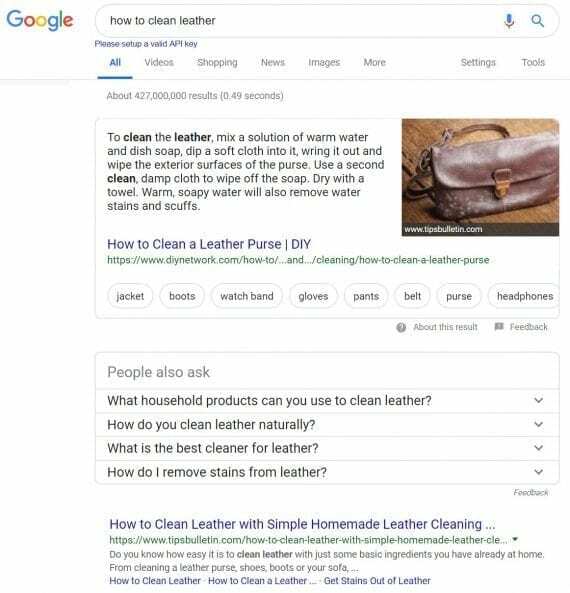 The mobile informational search at left, (“how to clean leather?”) and the mobile ecommerce search at right (“soft leather couch”) produce different results than on desktop searches. 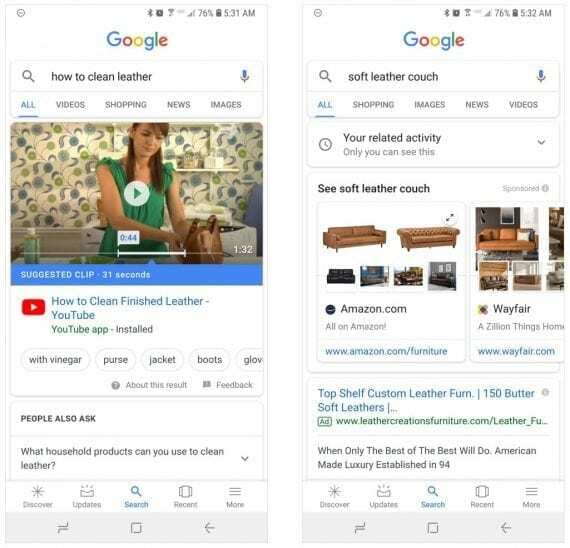 The two mobile screenshots above show the same informational (“how to clean leather?”) and ecommerce (“soft leather couch”) search queries as shown on the previous desktop example. The top mobile results for the informational search produced an explanatory video and then an ad. The top results for the ecommerce search produced only ads. It’s clear, in other words, why more mobile users do not click on anything. And considering that more than half of all Google searches are now on mobile devices, a larger section of the population is behaving in this way. What does this mean for search engine optimization? Is SEO dead, as has been asserted in the past? No. As long as people search, regardless of the platform or device, there will always be value in optimizing content and technology to target those searchers. What it does mean is that SEO practitioners need to get smarter about their tactics. Win the Answer Box. It’s what searchers see first in their results. It may be the only thing they look at if they receive the answer they’re looking for. Google’s Answer Box is also the spoken text in a voice search result on smart speakers. Rank in positions 1 through 3. Scrolling is no fun. Once they get an answer, consumers stop scrolling. Local search is critical for brick-and-click stores. When a “three pack” map appears in search results, it’s always at the top. There might be an ad or a natural listing above it, but it’s always prominent — near the top. In fact, I’ve seen local search listings cannibalize a company’s natural search traffic. Regardless, if you have physical stores, make sure they’re search optimized to win those impressions and earn an in-store visit, even if you lose a click. Use informational content. In my experience, it’s an uphill battle to get ecommerce sites to create content. But, most searches are informational, on mobile devices. And most mobile search-result clicks go to an ad or result in no click. Thus, the intersection of mobile and information is where ecommerce companies will likely meet searchers and earn their clicks. Drive authority. That same content that snags searchers can also boost your authority via new links and mentions. Compelling content is shared, and some of those shares convert to links from people who find it valuable enough to include in their blogs, media posts, or other sites. That authority is critical to winning the coveted and necessary first organic listings, which used to be top of the page and are now in the middle. Collaborate with paid media. Own as much of the search results page as possible. If you can’t compete in natural search for important search themes, then win with paid search and Google Shopping. A one-two punch of winning natural and paid rankings will be even better. Managing the two disciplines collaboratively will benefit your business.